This driver is so light, it comes with a leash for you to tie around your wrist. 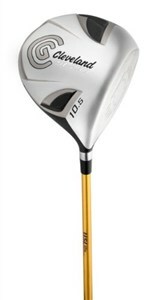 (Not really, but the driver is one of the lightest ones on the market.) It weighs in at a willowy 290 grams. Wait.. Where have I seen that number? Oh, that's why they call it the SL290. I get it. Traditional drivers weigh in around 315 grams. This differential equates to 2 to 3 mph of ball speed. Combine that with the COR (spring effect) that is 22% higher then the previous Launcher DST, and you've got a cannon in your hands. What I like most about the driver: Cleveland stayed with the traditional tear-shaped design. Because the driver is so light, they didn't feel the need to mold the shape into a fighter wing for aerodynamics like a lot of the other game-improving drivers on the market. What I don't like about the driver: There is no alignment aid, and Cleveland made the shaft longer -- it's 45.75 inches. This will equate to faster swing speeds, but at the expense of feel and control. You big swingers may have to dial back your swing a notch when facing one of those bowling alley (narrow) fairways. All in all, with this feathery driver you can expect more distance than whatever driver you're swinging now. You'll have to supply your own leash to keep it from floating out of your bag.